Cmdr. Hawkins is the chief commanding officer of the Explorer and the VV Force. He leads the crew in its exploratory mission to find new worlds, and instructs the VVF in exploration as well as in battle. It's appropriate that Hawkins is in charge of the Explorer, as he himself is a true explorer at heart. As such, he's very reluctant to go into battle, doing so only after exhausting all other options. Hawkins has made several peaceful overtures to the Drules, only to see them break down almost every time. While Hawkins sincerely craves peace, the Drules see it as naivetè as best and a trick at worst. But no matter how many times the Drules try to turn his peaceful intentions against him, Hawkins never gives up hope for a true, lasting peace. Capt. Newley is Cmdr. Hawkins' second-in-command in charge of the Explorer and the VV Force. During the series, Galaxy Garrison reassigned Newley back to Earth, though he would reunite with the Explorer crew as commander of a reinforcement fleet later in the series. VVF team leaders Jeff, Crik, and Cliff subsequently assumed his duties in rotating shifts as Acting Captains. Newley and Hawkins have a strong rapport—they agree on how to respond to situations most of the time, but when the rare conflict occurs, Newley always defers to his CO. Professor Page is the Explorer's chief scientist, specializing in biology; and chief medical officer. Some of the VVF wonder why he's even onboard, with his contrary ways. Crik's response: "He's real big on plant life!" 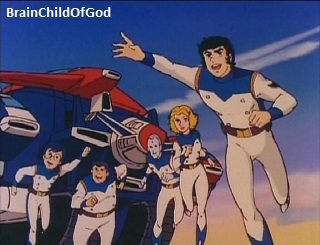 Jeff is the leader of the Air Team and Commander of the entire Voltron Force. As a leader, Jeff is bold, decisive, and quick to action—although he can also be hotheaded and impulsive. He stands in the gap between his teams and his superiors when he feels it's necessary, although his brashness has also brought him into some heated conflicts with the crew and his commanders. When Captain Newley was reassigned from the Explorer, Jeff, Crik, and Cliff were assigned to rotating shifts as Acting Captains serving at Cmdr. Hawkins' right hand. Like his Lion Voltron colleague Hunk, Rocky loves to eat. When he's not out on exploration or combat missions, he can found in the mess hall packing it away. He can also be as snarky as he is stocky—neither Drules nor allies are spared his wisecracks, delivered in his thick Brooklyn accent. Wolo is one of several non-Earth crewpersons on the VV Force and the only one on the Air Team. He is levelheaded but sometimes easily distracted: He is haunted by a traumatic childhood memory in which he saw his older brother severely injured. That memory hit Wolo hard while exploring a world very similar to his own, but he pulled himself together in time to help VV and exorcise his ghosts in the process. Chip and Pidge (who pilots Lion Voltron's Green Lion) are twin brothers. Chip is smart beyond his years—in "Letters from Home" (ep 35), Pidge wrote in a letter that Chip should be VV's head because he "always had the brains!" Like most twins, Chip and Pidge share a very close bond—so much so that one time when Chip didn't hear from his brother, he became so gripped with worry that he was briefly unable to perform his duties. Among VV fans, Ginger gets a bad rap (unfairly, IMHO), because at a glance she seems to be just a flirty airhead. Don't be fooled, though; you don't want to cross her in battle. She's tough as nails, and smart enough to jerry-rig VV to fire a supercharged electro-thermo-blast on the fly. Like her colleague Wolo, she's also haunted by her own childhood trauma—her mother was severely injured in an astroship incident. Also like Wolo, despite sustaining serious injuries in battle she would eventually toughen up and rejoin the team just in time. 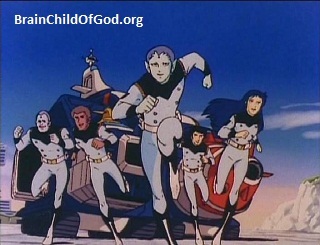 Crik is the leader of the Sea Team and second-in-command of the Voltron Force—he has taken command whenver Jeff is injured or missing. Once, Crik even ordered Voltron to form without the head after Jeff was knocked out. Crik is from a water world and seems to possess a "sixth sense" that causes a vague, uneasy feeling whenever danger threatens. In many ways, Crik is the yang to Jeff's yin: whereas Jeff is brash and impulsive, Crik is much more thoughtful and centered. Lisa is very sensitive and sentimental; often to a fault, if you asked certain fellow team members. She's also patient and a good listener; those qualities were especially helpful in bringing Chip out of his funk when he was worried about his twin brother Pidge. In the first ep ("In search of new worlds"), we learn that she's not from Earth. 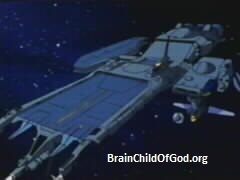 Little was revealed about Tangor in the series, beyond his name and what vehicle he pilots. Only Zandee had less dialogue than Tangor. From his appearance I'd guess that he and Wolo are from the same planet. He has an appetite that almost rivals Rocky's. Shannon is Irish and has the sterotypical temper to match. Of all the members of the VV Force, Shannon's contempt for the Drules is probably the most personal—his brother is a prisoner on Planet Doom. After the Explorer rescued a young Drule named Sandu who crashed during a combat exercise, Shannon wanted nothing more than to "teach him a lesson." But with some gentle prodding from his teammates (and some not-so-gentle prodding from Cmdr. Hawkins), the two become good friends. He's also clashed with Lisa over what he sees as her "child-like" sensitivity and sentimentality. Almost nothing was revealed about Zandee in the series, beyond his name and what vehicle he pilots. Frankly, I couldn't even guess what planet he's from. Of all the VVF, Zandee had the least dialogue throughout the series. 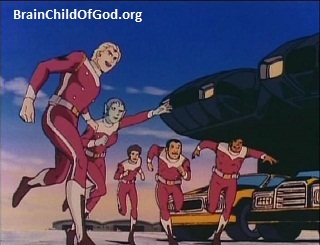 Cliff is the leader of the Land Team and third-in-command of the VV Force. He hails from rural Australia. Where Jeff is hotheaded and Crik is very even-keeled, Cliff's personality falls somewhere in-between those two extremes. Even in high-tension situations, Cliff will quietly and patiently stand by until further orders, and encourage his teammates to do likewise. Though from the same water world as Crik, Sinda's passion is land exploration—in fact, the more rugged the terrain, the better. Also like Crik, she possesses a "danger sense," though not as strong as his. When not on combat or exploration missions, she can most often be found bonding with Crik or socializing with the other VVF ladies. Modock is hardy and scrappy; on more than one occasion he's fought through serious pain and injury to help his teammates. While out on exploration, he sometimes neglects to take all proper precautions before stepping into unknown situations—which often results in his sustaining such injuries in the first place. Marvin and Hutch could almost be combined into one bio; one's rarely seen without the other. Marvin likes doing things that drive Hutch crazy, like trying to cheat in poker games with him. Whenever they really get into it, Jeff and the other team members usually prefer to just hold off and let them fight it out (and enjoy the show in the meantime), knowing that they're really best friends and are just venting. While team leader Cliff "goes by the book," Hutch isn't nearly so patient. In high-tension situations, he "asks questions" and demands answers and action. When he thinks something needs to be done, he wants to do it yesterday. Hutch and Marvin are best friends, but they often get under each other's skin and fight like brothers. In "Planet of the Bats" (ep 10), Modock is stricken severely ill. He's shown to be flying #13 in this ep. In "Try this world for size" (ep 5), Sinda and Modock are traveling as a pair exploring a world. They're both clearly driving hand ships. Even though this ep doesn't show specifically who's driving which hand, since we already know Modock pilots #13 we can infer that Sinda must operate #12.